Charlie saw both his pediatrician and his neurologist this for a 6 month check in. His Neurologist performed a physical assessment and decided that Charlie can finally be weaned off of the Phenobarbital! Charlie has already started a decreased dose and if all goes well, he will be completely Phenobarbital free in three weeks. It was originally prescribed to stop Charlie from having seizures and has served its purpose. Charlie has not had a seizure since his first round of episodes on August 5th. Charlie's neurologist expressed concern about his lack of muscle tone and "floppiness". He reiterated how important Charlie's physical therapy will be from here on out. After observing Charlie for a half hour, the doctor affirmed Charlie's cognitive health, saying that he is "well connected, alert and showing all the normal signs of mental and emotional health." Charlie will only see the neurologist now on an as-needed basis. He'll probably have a repeat MRI at some point, but that may be as long as a year out. 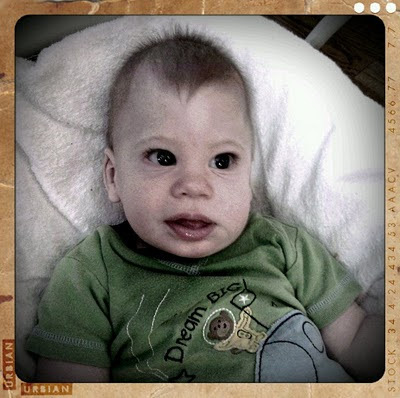 So, Charlie now has the "go ahead" for craniofacial surgery from his cardiologist and his neurologist. Charlie's pediatrician was very pleased to see that Charlie is well and healthy and showing signs of physical improvement, which include increased head control, strong core muscle engagement and the ability to reach out and grab objects with left (affected) hand. Charlie is now 20 pound, 8 ounces (100th percentile for weight) and 29.5 inches long (off the charts for length). Next on the list: urology. Charlie will have a Voiding Cystourethrogram (VCUG) on Valentine's day and a follow up appointment just before his blessing on February 26th. His urologist will assess the state of Charlie's kidneys and decide weather surgery is required to fix the duplicate collecting system. Thank you for your continued support and well wishing as Charlie gears up for his big summer surgery. As many of you know, this is a delicate, out-of-network surgery that will require the Greenman Family's full attention and energy. Luckily, Charlie shows all the signs of physical and mental readiness. So, as always, more news later.